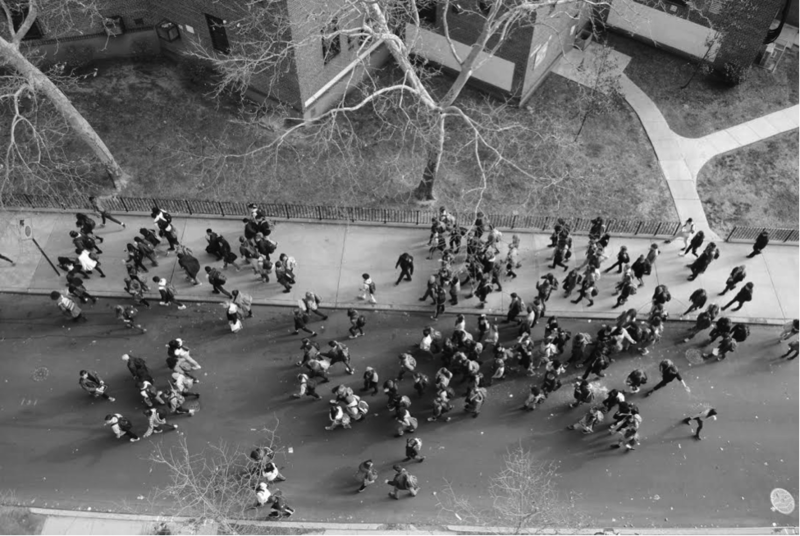 BHSEC students marching from the school to Union Square during the Walk Out. Photo credit to Ayla Safran, ’15. At 12:01 p.m. on Monday, December 1st, nearly 150 BHSEC students walked out of their classes and took to the streets, protesting the non-indictment of police officer Darren Wilson in the fatal shooting of Michael Brown. The action was part of the “Hands Up Walkout,” a nationwide movement coordinated by the Ferguson Action Team. At over 30 college campuses and businesses across the nation, students and employees transformed a normal Monday into a day of rage and reflection. The date and time of the walkout carried symbolic value. The walkout occurred exactly one week after the non-indictment decision was released. 12:01 p.m. C.T. marked the time of Michael Brown’s death on August 9. BHSEC students who left in the middle of fourth period classes assembled on the sidewalk across from school. Within minutes, nearly a quarter of the student population had gathered for the march, with representation from every grade. Some students came out to watch the proceedings but returned to class. Hoisting signs high, the student group turned up E. Houston Street and began marching to Union Square, to join other protesters. The BHSEC group took up half a block, and made their message clear to passersby. “Indict! Convict! Send those killer cops to jail! The whole damn system is guilty as hell!” they chanted. The students sang the call-and-response chants that have come to define the recent protests in Ferguson, MO and across the country. “No justice, no peace, no racist police!” “Hands up, DON’T SHOOT!” “Out of the schools, INTO THE STREETS!” they shouted, trailed by a School Safety van. The truant officers did not intervene with the student march, and did not follow the students when the group turned off E. Houston Street and began walking northward on Avenue A. The group threaded its way through the East Village, navigating up St. Mark’s Place and onto Broadway. Passing cars gave honks of support to the protesters, and some construction workers stopped their drilling to hear the march. A woman on a fire escape high above Broadway blew a conch shell in time with the students’ chants. Eventually, the group mobilized, and circled Union Square, chanting and waving posters. “Stop killing our children” read one sign. “It is a race issue,” read another. The protesters squeezed through the corridors of the Holiday Market, circled Union Square once more, and then went on to Times Square. Many protesters left the sidewalks and walked into the streets, halting traffic. At times, police officers on motorbikes attempted to cut off the protesters and force them back on the sidewalk. A few arrests were made. There were “lots of police circling the march” Y2 Lilabet Johnstongil said. “When we were marching down the street, they kept pulling out in front of us.” Eventually, the group made it to Times Square, where protesters staged a massive die-in and more speeches were made. Y1 student leader Emma Morgan-Bennett said that there was minimal organization in the lead-up to the walkout. As Y2 Cena Loffredo said, the BHSEC contingency was “spontaneous, to a certain extent.” Many students found out about the walkout on the morning of, by word-of-mouth or through the fliers that were distributed outside of school.